Make informed decisions using exactly the information you need at any given moment. JetViewer's simple but extremely powerful interface is uniquely designed to let people access exactly the data they want. You can quickly identify specific information and follow intelligent links to related information. JetViewer builds up exceptionally powerful queries, step by step, without the user needing to understand the underlying systems. Queries are built up using a number of simple individual criteria. 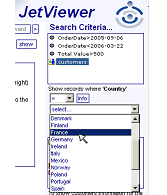 The fields from your information sources are used to automatically define the filter options and JetViewer always shows you where you are and what you are looking at, at any point. The result is needs focused information and reports, helping you to add value to your business by better understanding your status and opportunities. JetViewer puts the right information into your hands so you can make informed decisions quickly. Richard O'Driscoll, Chief Financial Officer, Jordan Grand Prix.